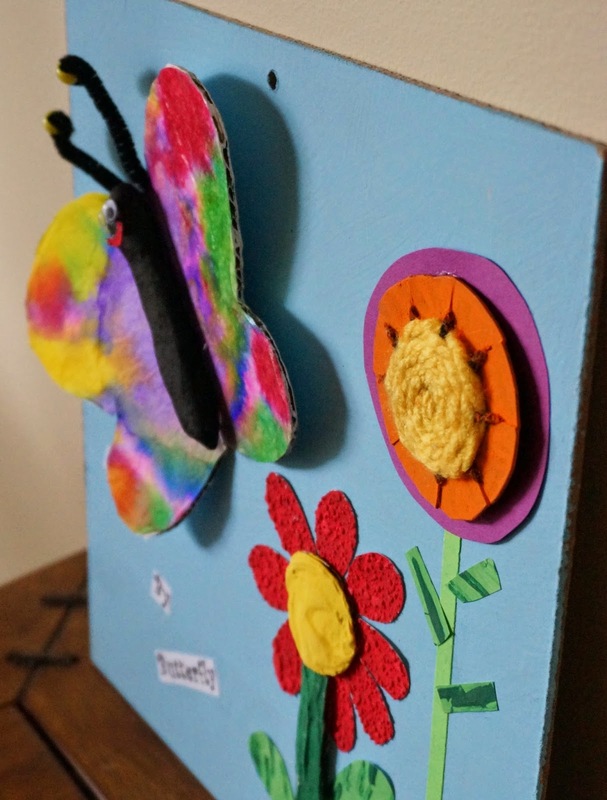 Here is another butterfly project I recently completed with grade1/2. It combines a few mediums, papier mache, weaving, using drywall, and the use of dye. It gave the students a good chance to try out all these techniques. Lots of 3D action here. Take a section of newspaper and roll into a body shape. Tape with masking tape. Mix up some white glue and water (1 to 1 ratio). Have some paper towel strips ready to go. Our butterfly body is pretty small so not much papier mache is required. Cover butterfly body with 2 layers of mache, just enough to cover it and hold it together. With scraps of cardboard cut out a long strip for a stem and a circle for a flower centre. I did not use the petal shapes in this project. Working on top of wax paper or newspaper, coat the front of the pieces with drywall filler. In the meantime paint your background with blue acrylic paint. Originally I was going to have them all taped so that we would also paint in the ground section. I decided at the last minute to remove the tape, this gave us all sky and more room to place all our elements. Out of some extra corrugated cardboard I cut a butterfly shape. For the kids I pre cut this for them, if I had more time I would have had them cut their own. We painted some paper red for our flower petals. I used some paintable wall paper to get that nice texture. If you use paintable wallpaper you must use acrylic paint, the tempera doesn't stick. I don't have a picture of the process, just the end product. I had the students dye some coffee filters. We used Easter egg dye which I always have on hand for Pysanky. I put some different colours into little cups and gave them eyedroppers to use for each colour. The colours are always spectacular! We worked on top of a piece of newspaper that was on top of a piece of wax paper. I kept the newspaper as it had wonderful colours to use in future collage projects. When the papier mache body was dry we painted it black. Glue the dry dyed coffee filter to the white butterfly, right on top of the white. It needed to be painted white to show off those spectacular colours. Trim away the excess to reveal the butterfly shape. Paint the stem and the flower centre with acrylic paints. 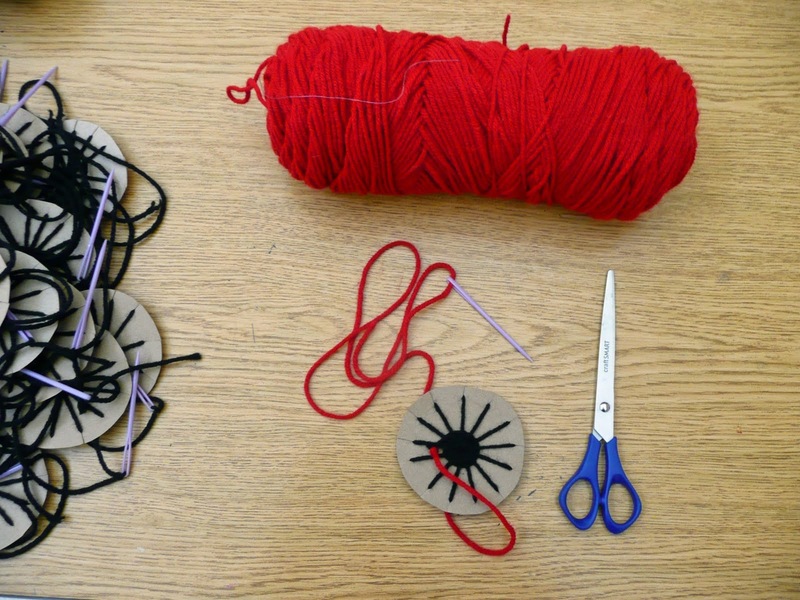 To add extra interest I had each student weave a circle to use as a flower. I use the technique I outline here in the woven eyed frog project. Glue the pieces together on the background. For fussy pieces you can have an adult assist with a glue gun. We used a glue gun for the butterfly wings and the antennae. Add 2 goggly eyes and a mouth if you wish. I ran some green card stock through the paper shredder to make some long stems. We also used scraps of green painted paper to make the leaves. 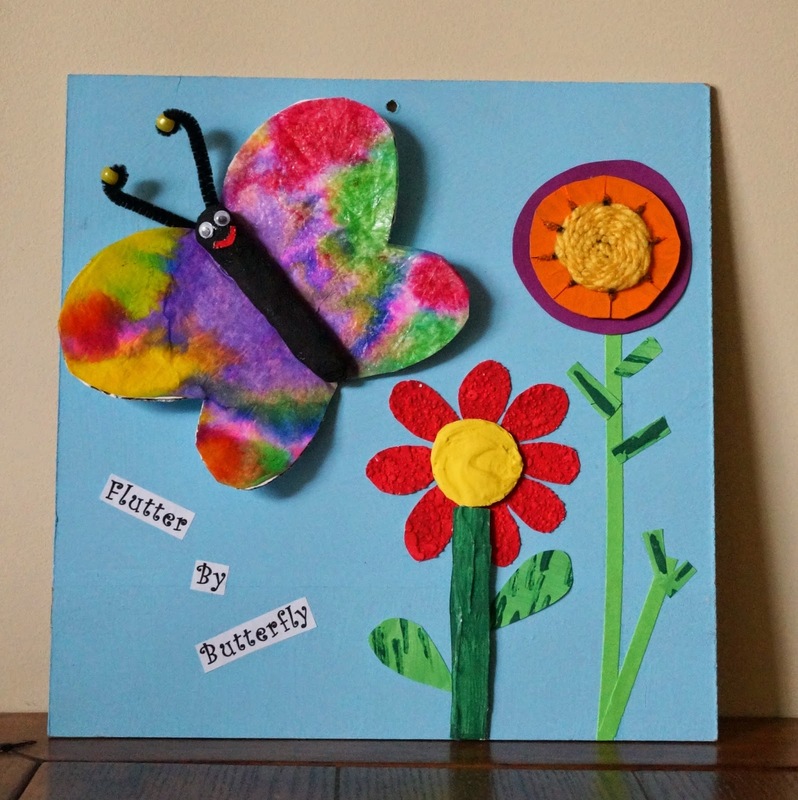 Finally we added the text "Flutter By Butterfly". Some kids switched it to "Butterfly Flutter By". See you next time, school is almost done, counting the days! All the 3D elements are fantastic. I really like that you had the children weave the flowers - very nice touch!